affected quite directly, through a process called “entraining.” It was the slippage between electromagnetics, physiology, and emotion that fascinated me. Emotions can be “seen” in the patterns of the brain’s firing. I was scared to death / I could have died of joy is a simultaneous seduction between two extremes: rapture and fear. tubes (5-inch diameter x 4 feet long) and create phosphorescence. 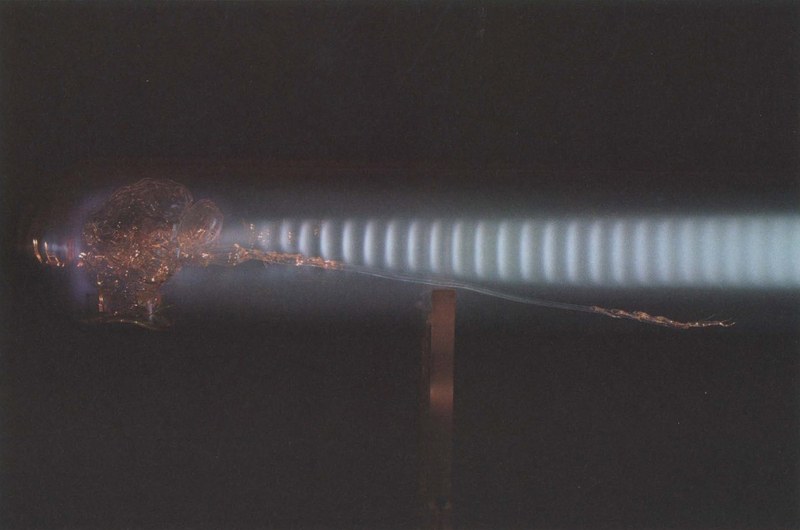 When the glass tubes are touched, the trapped plasma is attracted to the hands, which act as a capacitive path to ground as bodies become part of the plasma-path circuit. The phosphorescent gases begin to pulse. A computer board controls the timing of the rhythm. The pulsating patterns are based on scientific research conducted on the brain’s electromagnetic behavior.